I’m heading back to one of my favorite cities in the world in May, to Madrid. 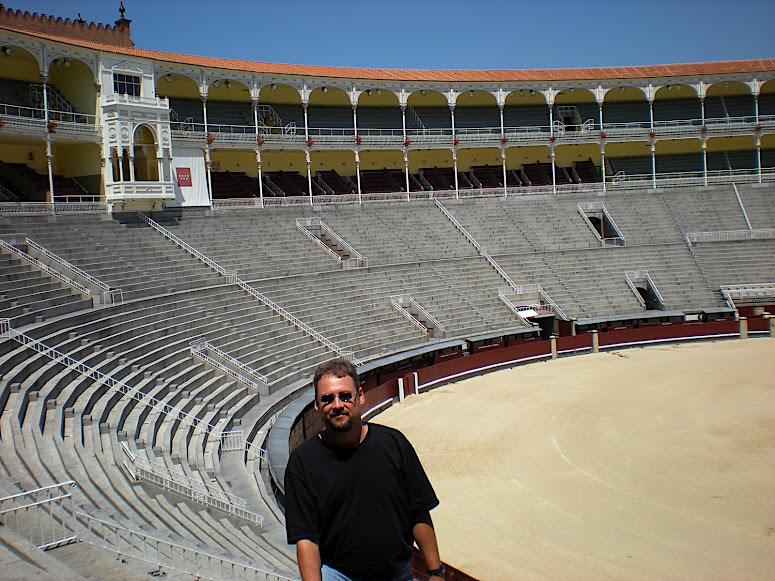 Turbo during his first visit to Madrid in June 2008, where he visited the world-famous Plaza de Toros de Las Ventas, the "home" of bullfighting in Spain. I first visited Madrid traveling on business in June 2008, an auspicious time to be there, as the UEFA Euro 2008 tournament was quickly winding down to a conclusion. One night, June 10th to be precise, my IBM cabal and I were looking for a small bar or restaurant to take in the Spain v. Russia match, when we heard a loud cheer go up in unison across the city. “Spain one, Russia nil,” I announced. That echo sent chills down my spine, as did the wild celebration later that evening after Spain trounced Russia 4-1. Spain later went on to win the whole shebang in a 1-0 final over Germany. If you’ve never visited Madrid, I’m going to provide you with an excellent raison: The IBM Smarter Commerce Global Summit 2012. From May 22-24, the IBM Smarter Commerce will be the most significant European gathering of marketing professionals in a single place, one filled with four days of learning, networking, and exploring best practices in the commerce realm. 1. You get to network with Turbo. 2. You get to hang at the hotel bar with Turbo. Oh, wait. That was a different list. Anyway, once you preview the sessions with your boss you won’t have to do much convincing. They’re going to have to drag me away kicking and screaming. Here’s the bottom line page: Register here. Before April 1, you only have to pay 895 Euros, at which point it goes up to 1195 Euros. In the meantime, keep an eye out here on the Turbo blog, as I expect I’ll be passing along some travel tips (including restaurant and sightseeing recommendations) for Madrid. As a marketer for IBM who specializes in the digital realm, I was excited to hear about the pending IBM 2011 Global Chief Marketing Officer study, a study of more than 1,700 chief marketing officers from 64 countries and 19 industries, and couldn’t wait to see the results. Today, IBM released the results of this important study, one that reveals that the majority of the world’s top marketing executives recognize there’s a critical and permanent shift occurring in the way they engage with their customers, but who also question whether their marketing organizations are prepared to manage the change. Click to enlarge. 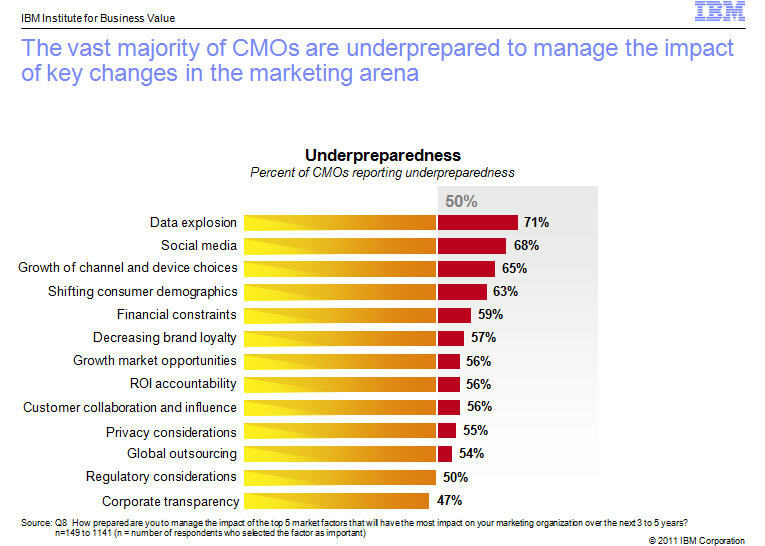 The vast majority of CMOs surveyed in the IBM 2011 CMO Study indicated that they are underprepared to manage the impact of key changes in the marketing arena. Some other initial headlines: The study reveals that the measures used to evaluate marketing are changing. Nearly two-thirds of CMOs think return on marketing investment will be the primary measure of the marketing function’s effectiveness by 2015. But even among the most successful enterprises, half of all CMOs feel insufficiently prepared to provide hard numbers. Most of these executives — responsible for the integrated marketing of their organization’s products, services and brand reputations –- say they lack significant influence in key areas such as product development, pricing and selection of sales channels. The IBM study found that only 26 percent of CMOs are tracking blogs, 42 percent are tracking third party reviews and 48 percent are tracking consumer reviews to help shape their marketing strategies. Customers are sharing their experiences widely online, giving them more control and influence over brands. This shift in the balance of power from organizations to their customers requires new marketing approaches, tools and skills in order to stay competitive. CMOs are aware of this changing landscape, but are struggling to respond. Four out of five CMOs expect that they will have to make fundamental changes to traditional methods of brand and product marketing. Baird likened marketers who underestimate the impact of social media to those who were slow to view the Internet as a new and powerful platform for commerce. Like the rise of e-business more than a decade ago, the radical embrace of social media by all customer demographic categories represents an opportunity for marketers to drive increased revenue, brand value and to reinvent the nature of the relationship between enterprises and the buyers of their offerings. Marketers who establish a culture receptive to deriving insight from social media will be far better prepared to anticipate future shifts in markets and technology. As someone who has been intimately involved in helping IBM make a successful transition into providing enhanced social intelligence for marketers here inside Big Blue, this is music to my ears. While CMOs identify customer intimacy as a top priority, and recognize the impact of real-time data supplementing traditional methods of channel marketing and gathering market feedback, most CMOs say they remain mired in 20th century approaches. Eighty-percent or more of the CMOs surveyed are still focusing primarily on traditional sources of information such as market research and competitive benchmarking, and 68 percent rely on sales campaign analysis to make strategic decisions. Click to enlarge. 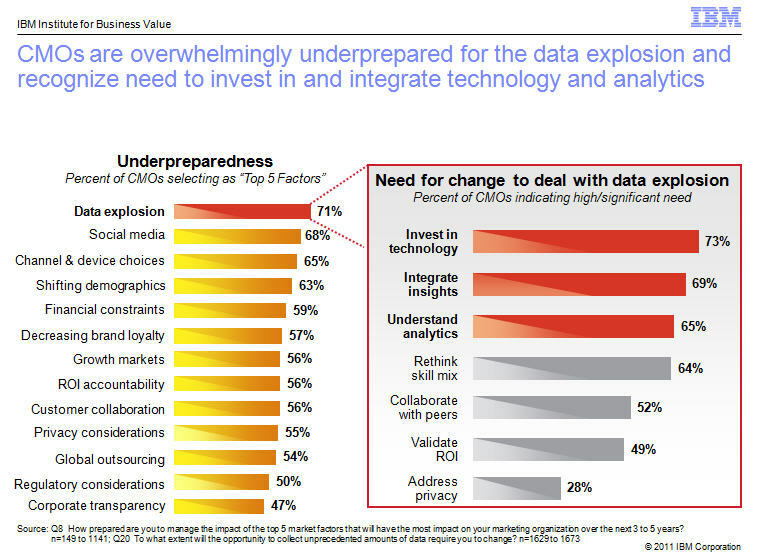 CMOs surveyed in the study indicated they are overwhelmingly underprepared for the data explosion and recognize need to invest in and integrate technology and analytics. Collectively, the study findings point to four key challenges that CMOs everywhere are confronting. The explosion of data, social media, channel and device choices and shifting demographics will be pervasive, universal game changers for their marketing organizations over the next three to five years. But a large majority of CMOs feel unprepared to manage their impact. Data explosion: Every day we create 2.5 quintillion bytes of data – so much that 90 percent of the world’s data today has been created in the last two years alone. The increasing volume, variety and velocity of data available from new digital sources like social networks, in addition to traditional sources such as sales data and market research, tops the list of CMO challenges. The difficulty is how to analyze these vast quantities of data to extract the meaningful insights, and use them effectively to improve products, services and the customer experience. Social platforms: Social media enables anyone to become a publisher, broadcaster and critic. Facebook has more than 750 million active users, with the average user posting 90 pieces of content a month. Twitter users send about 140 million tweets a day. And YouTube’s 490 million users upload more video content in a 60-day period than the three major U.S. television networks created in 60 years. Marketers are using social platforms to communicate – with 56 percent of CMOs viewing social media as a key engagement channel – but they still struggle with capturing valuable customer insight from the unstructured data that customers and potential customers produce. Channel and device choices: The growing number of new marketing channels and devices, from smart phones to tablets, is quickly becoming a priority for CMOs. Mobile commerce is expected to reach $31 billion by 2016, representing a compound annual growth rate of 39 percent from 2011 to 2016. Meanwhile, the tablet market is expected to reach nearly 70 million units worldwide by the end of this year, growing to 294 million units by 2015. Shifting demographics: New global markets and the influx of younger generations with different patterns of information access and consumption are changing the face of the marketplace. In India, as one example, the middle class is expected to soar from roughly 5 percent of the population to more than 40 percent in the next two decades. Marketers who have historically focused on affluent Indian consumers must adapt their strategies to market to this emerging middle class. In the United States, marketing executives must respond to the aging baby boomer generation and growing Hispanic population. Today’s CMOs have to cover more ground than ever before. They have to manage more data from disparate sources, understand and engage with more empowered customers, adopt and adapt to more sophisticated tools and technologies – while being more financially accountable to their organizations. Click to enlarge. 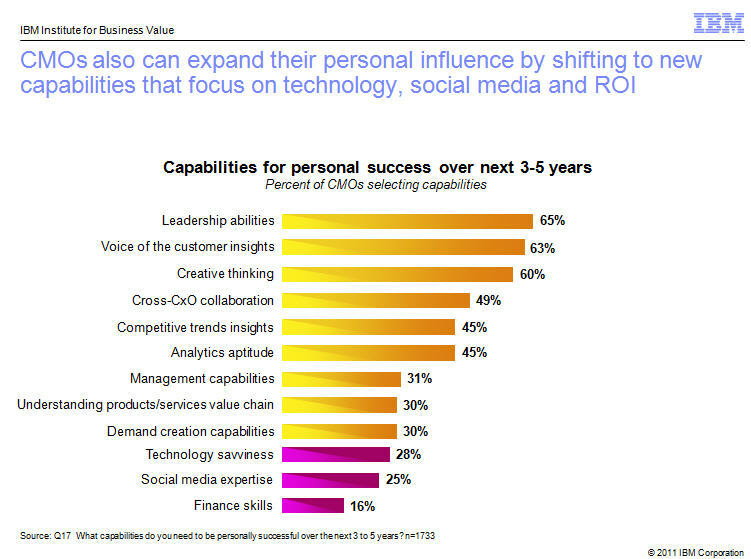 CMOs surveyed believe that they can expand their personal influence by shifting to new capabilities that focus on technology, social media and ROI. In fact, 63 percent of CMOs believe return on investment (ROI) on marketing spend will be the most important measure of their success by 2015. However, only 44 percent feel fully prepared to be held accountable for marketing ROI. Most CMOs have not traditionally been expected to provide hard financial evidence of their ROI. But given the current economic volatility and pressure to be profitable, organizations can no longer afford to write a blank check for their marketing initiatives. CMOs recognize they now need to quantify the value they bring to the business, be it from investing in advertising, new technologies or any other activity. This increasing emphasis on ROI also reflects the scrutiny the marketing function is currently attracting, itself a reflection of the function’s growing prominence. Today’s CMOs are in much the same position as chief financial officers (CFOs) were a decade ago, when their role was evolving from guardian of the purse strings to strategic business adviser. If CMOs are to be held responsible for the marketing returns they deliver, they must also have significant influence over all “Four Ps”: promotion, products, place and price. The study found that this is often not the case. CMOs say they exert a strong influence over promotional activities such as advertising, external communications and social media initiatives. But, in general, they play a smaller role in shaping the other three Ps. Less than half of the CMOs surveyed have much sway over key parts of the pricing process, and less than half have much impact on new product development or channel selection. To meet these new challenges, CMOs must boost their own digital, technological and financial proficiency –- but many seem surprisingly reticent in this respect. When asked which attributes they will need to be personally successful over the next three to five years, only 28 percent said technological competence, 25 percent said social media expertise and 16 percent said financial acumen. The 2011 IBM Global Chief Marketing Officer Study is IBM’s first study of CMOs — and the fifteenth in the ongoing series of C-suite Studies developed by the IBM Institute for Business Value. Between February and June 2011, IBM met face to face with 1,734 CMOs in 19 industries and 64 countries to better understand their goals and the challenges they confront. The respondents came from a wide variety of organizations, ranging from 48 of the top 100 brands listed in the 2010 Interbrand rankings to enterprises with a primarily local profile. Click here to register and receive your copy of the IBM 2011 Global Chief Marketing Officer study. The IBM Unica Marketing Innovation Summit is currently underway in Boston, Massachusetts (and for those of you in Berlin, will be in your fair city June 6-8). At the event earlier today, IBM released its recent study, “The State of Marketing 2011,” which provided some very interesting and telling findings about that very topic. As a marketer myself, I find myself eating up this kind of research, particularly in the kind of ever-volatile marketing environment we find ourselves operating in. This study represents a comprehensive survey of almost 300 online and direct marketers from a mix of companies, revenues, and industries, and all responding companies reported more than $100M in revenue, with the largest block (54%) having over $1B revenue per annum. All assume responsibilties across the complete spectrum of marketing roles, and over one third (35%) were marketing executives. Marketers Seem Ready to Bridge the Gap Between Analysis and Action. This year, “measurement, analysis and learning” overtook “IT support of marketing needs” as the #1 marketing bottleneck. After years of analysis paralysis, respondents identified “turning data-into-action” as their #1 org issue. Can you relate? Marketers Believe Technology Can Ease Their Pain. Over half also cited technology as the key to productivity. Marketers absolutely see technology helping resolve the challenge of meaningful measurement and analysis, and then choosing the next course of action — moreso, gasp, than additional staff or agency support. Marketers Believe in Interactive Marketing, But Have More Progress to Make Toward This Vision. While responses suggest that interest in achieving truly integrated cross-channel dialogs with customers is high, nearly half of survey participants report that they are only partially achieving that goal. The key barrier? Organizational structure and internal processes. Yet, 57% report the adoption of inbound marketing methods (personalized targeting/messaging) in their Web channels. Web Data is Highly Prized, But Putting it to Work in Campaign Decisioning Still Lags. Here’s a paradox for you: 92% of marketers appreciate the value and importance of Web data, yet half or less apply that data to customer analyses and campaigns. Of those that do, less than a third believe their efforts are very effective. Mobile Marketing Continues to Rise. Consumers are rapidly adopting connected mobile devices and smart marketers are aggressively following their audience. 43$ of respondents say they currently use the tactic, with another 23% planning to do so within a year. Yet, there’s still plenty of room for integration with other marketing efforts. So, for you marketers in the virtual room, do these all sound familiar? We as marketers are faced with an extraordinary pace of change and new capability, but the rapidity of these changes is outpacing our ability to maximize our embrace of all the new data and opportunity these capabilities create. Yet, we can’t simply throw people at the problem (internal or agency partners). We need to find more intelligent ways of utilizing technology to help breakdown barriers in the organization, integrate the view and responses to the consumer, and probably most pointedly, find a way to take all this new data and be able to quickly “action” it to the benefit of our marketing efforts (and, in turn, to our customers). Those are just the highlights. Click here to get the full report (in PDF format) to see the full sampling and analysis. But, as the report itself summarizes, the good news in all this is that the proliferation of electronic channels has opened up many more possibilities for meaningful communications with customers. The bad news, of course, is that with rapid channel proliferation we get mass confusion. In an environment already suffering from info overload, each new channel, tactic, and tool generates a flood of data that demands attention. If you are interested in learning more about how intelligence, integration, and interactivity can drive your business results, visit our Interactive Marketing Resource Center. There, you can get access to a video about the power of integrated marketing solutions and download the Unica Interactive Marketing eBook. Or, you can continue floundering amidst all that endless trail of new marketing data and endure more analysis paralysis. IBM Software’s business development team has had a busy week. IBM today announced they have entered into a definitive agreement for IBM to acquire Unica in a cash transaction at a price of $21 per share, or at a net price of approximately $480 million, after adjusting for cash. A publicly held company in Waltham, Mass., Unica will expand IBM’s ability to help organizations analyze and predict customer preferences and develop more targeted marketing campaigns. Unica’s comprehensive approach to interactive marketing enables more than 1,500 organizations worldwide to understand what makes their customers tick and leverage that understanding to engage buyers in highly relevant, interactive dialogs across digital, social, and traditional marketing channels. Leading-edge companies place a high value on a consistent and relevant customer experience. They must continuously focus on enhancing their brand by responding quickly to marketplace changes and differentiating themselves through more targeted, personalized marketing campaigns (including we marketers at IBM). In order to achieve this, marketing professionals are increasingly investing in technology to automate and manage marketing planning and execution to help them better analyze customer preferences and trends and in turn, predict buying needs and drive relevant campaigns. To meet this demand, IBM is assembling transformational capabilities to help clients create this consistent and relevant cross-channel brand experience to promote customer loyalty and satisfaction. With sophisticated analytics and marketing process improvement, the combination of IBM and Unica will help clients streamline and integrate key processes including relationship marketing, online marketing and marketing operations. Today’s news expands IBM’s growing portfolio of industry software solutions designed to help companies automate, manage, and accelerate core business processes across marketing, demand generation, sales, order processing and fulfillment. This acquisition along with IBM’s recent acquisitions of Sterling Commerce and Coremetrics will enhance IBM’s ability to support customers increasing demands in this growing market. Unica’s 500 employees will be integrated into IBM’s Software Solutions Group, which includes a range of industry-focused offerings. Unica software will complement the capabilities of IBM’s Business Analytics and Optimization Consulting organization – a team of 5,000 consultants and a network of analytics solution centers, backed by an overall investment of more than $11 billion in acquisitions in the last five years.